Brother Stern was my first painted miniature in 10+ years a while back. My wife surprised me one christmas with this miniature, and followed that surprise by pulling out a gandolf miniature for her to paint. Her gandalf is still the only mini she has painted, but this one fig brought me back into the hobby side of things. 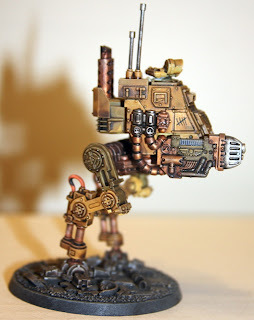 Sitting with my wife painting a mini was just plain awesome! You can see how rusty I was after years away from the brush. 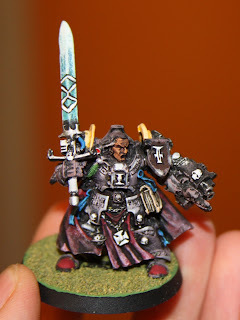 I tried to paint battered armor in colors of my Iron Scythes custom chapter even though Stern was a grey knight. Recently I decided to pick up a GK army, so this fig needed to be refurbished. My skills have improved over the year, and it seemed wasteful to buy another one. A dip in green stuff and then a solid scrubbing was all that was needed to get most of the paint off. 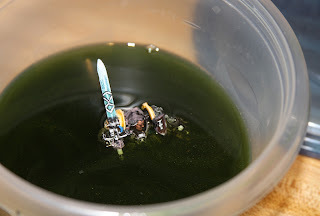 I have the mini soaking again, and will probably do one more scrubbing, but I am very happy with the results. 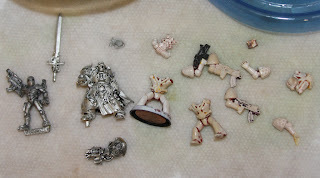 As you can see from the other figs, I soaked an imperial assassin, as well as a bunch of my old RT marines. 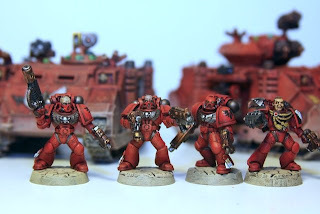 I am thinking about turning the old RT marines into an Ad Mec army. 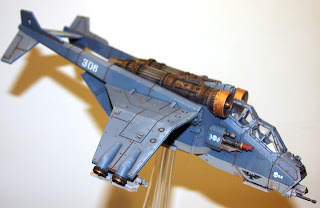 I love this model. 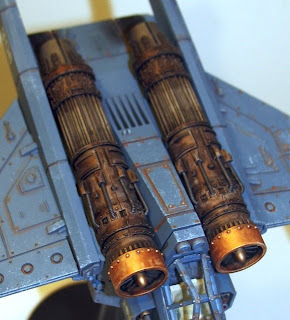 I used very thinned down paint to create the dirty washed out look of the engines. I use eye liner smudged around to do the smoke stains at back. 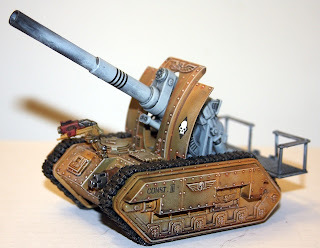 I used Tamiya x20 paint thinner to tone down the blazing orange I used for rust. I used model master enamel spray paint for the cream interior, the grey bottom, and the blue top. 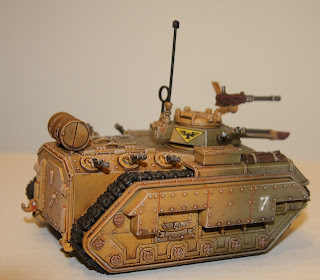 I think my us of enamel paint may have made using transfers more difficult, but I'll have to wait an see if my land raider ends up difficult to work with due to its enamel base coat. Why not. 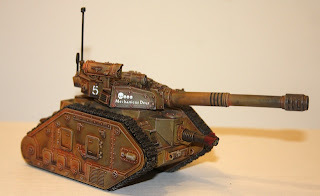 Washes are so damn fun! 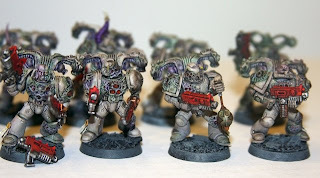 I might end up with a Chaos army after all! 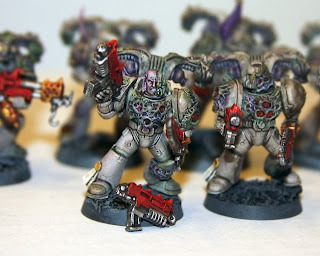 In order to torment Dark Angels players I decided to build some chosen as traitor DA. 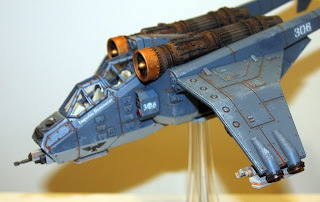 The fun part was not making them Unforgiven, but DA that turned traitor after the Horus Heresy. 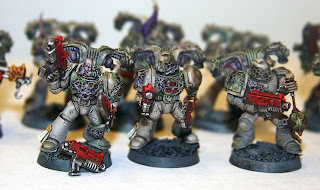 I wanted to give sculpting a try and decided that Plague marines were the way to go. 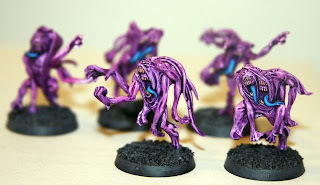 I hadn't intended in painting them this way, but for some reason I decided to try and paint mostly with washes. 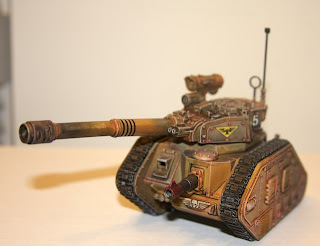 I have had a great time reading the forgeworld books and have been trying to put into practice some of their weathering techniques. These are still WIP, but I really love the way they are turning out. 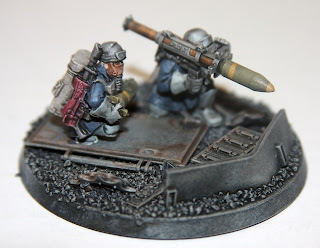 All of those ruined city scape bases I have been making have been going towards my imperial guard army. 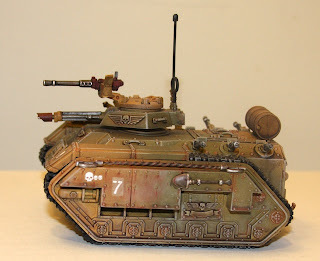 I am making a mixed force, using Armageddon Steel Legion, Vostroyans, and Cadians. 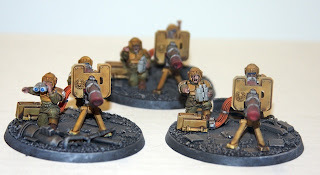 The bases are all the same style, and the lasguns all have red elements. 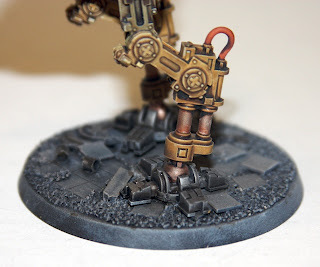 I posted a tutorial on how to crank out the bases last month. 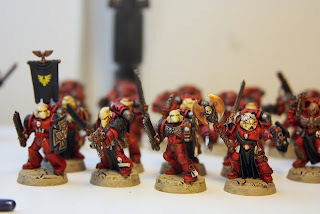 I took a break from my custom chapter a while ago to paint some blood angels. I tried some techniques I have not used before, and generally had a great time. 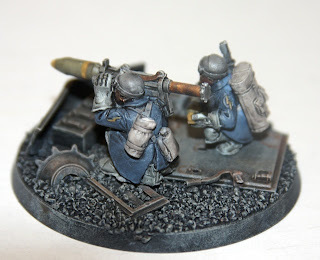 As for basing I used green stuff sculpted bases, which were then painted up to look like cracked earth. 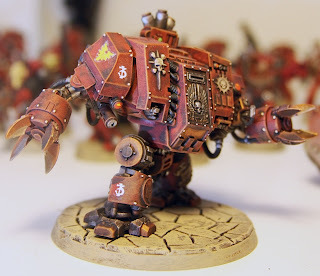 The dread has forgeworld arms, but other than that has minimal modifications. 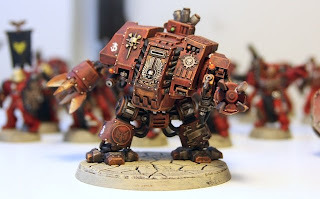 I love the Assault on Black Reach dreadnought, and have a bunch more to convert up as I see fit. I cut the legs from the torso and shifted the pose a bit to make it look like the interred marine is swinging his close combat arms. 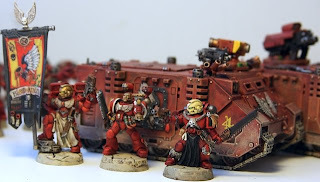 The tactical marines were a quick paint job in order to have at least one tactical squad in the army. I've started painting very quickly, finishing a small army in a month or so, and think I should slow down a bit.